We can teach you to sail our sailing dinghies and our charter yacht. We offer many different sailing courses for all skill levels. Book a sailing lesson or a course today from the list below. If you need to book accommodation for your stay on Koh Tao, we can organise this for you too. We offer private sailing lessons on an hourly basis. 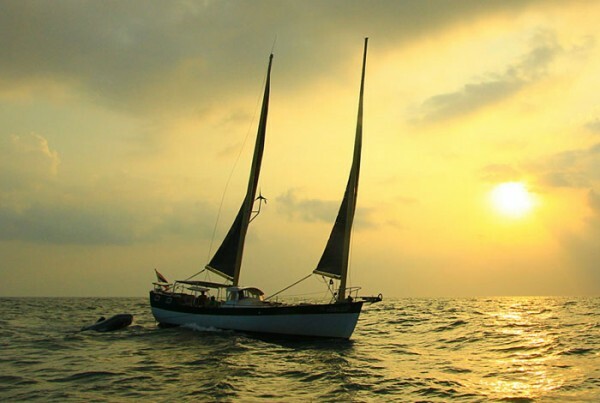 The content of the sailing lessons are completely determined by the student’s skill level and are highly flexible. This four hour introductory sailing lesson is designed to give you a taste of the freedom and fun sailing your own boat can provide. The course consists of three hours active sailing in one of our dinghies, with personal one on one tuition from the instructor as well as one hour rigging and basic sailing theory. 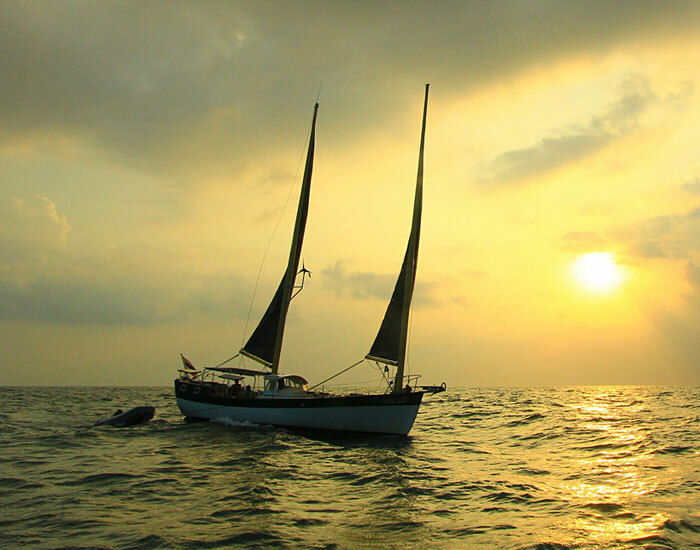 The goal of this five day sailing course is to get you completely familiar and comfortable with all aspects of sailing a small boat all by yourself. This includes, rigging, launching, sailing solo and de-rigging. You will also learn sailing terminology and sail theory. This sailing course is designed for sailors who already know how to sail proficiently but would like to further their education and experience. This course is flexible in its content and can include advanced sail theory, kinetics, racing rules, tactics, strategy, advanced racing maneuvers such as roll tacks and much more. 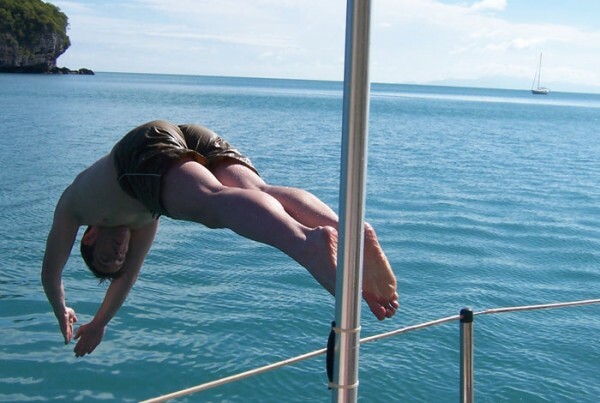 Join in competent crew courses aboard our 40ft. ketch rigged blue-water cruiser. Crew return to shore every evening to their own accommodation. Lunch is provided every day. Breakfasts, dinners and accommodation are not included on this course. Join in live-aboard competent crew courses aboard our 40ft. ketch rigged blue-water cruiser. Crew live-aboard Freedom Fargo every evening instead of returning to shore, and cater for themselves and the captain in the galley. Want to learn to sail just the two of you? 2 person Private charter live-aboard competent crew courses aboard our 40ft. 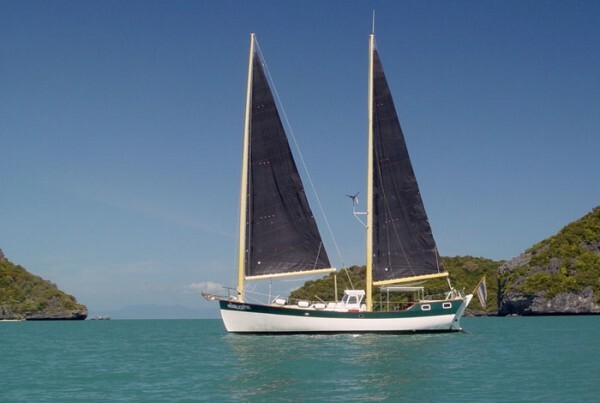 ketch rigged blue-water cruiser. You and your partner live-aboard Freedom Fargo every evening instead of returning to shore, and cater for yourselves and the captain in the galley. Couples can share our luxurious aft double cabin, while if you are just friends, one of you has the aft double cabin and the other has the luxurious double v-birth in the bow. 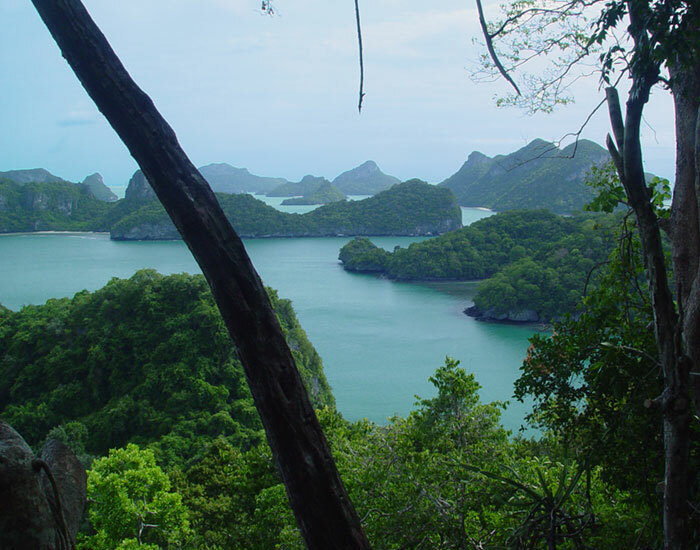 With 42 islands spread out over 102 square kilometers, Ang Thong Marine Park is one of our most popular charter destinations. We sail to the Ang Thong from Ko Tao, where you are then free to explore the cave systems, hidden lagoons, beautiful secluded beaches, view points and the wild life. Snorkelling around the Ang Thong can be truly spectacular. You will be picked up from your accommodation at 9am, then meet the Island Cruises team on board your charter yacht and set sails to cover the distance from Koh Tao to the Angthong Marine Park. Lunch will be served aboard the Island Cruises Sailing Yacht. Upon arrival in Angthong (approx. 4-5pm), guests can shake off their sea legs for an evening on the beach of Koh Wua Talap. Dinner will be served aboard around sunset. Enjoy a hearty breakfast served and provided by your Island Cruises team, then take a light hiking excursion to the best view point in the area; some say perhaps one of the best view points in Thailand itself. At this time of the day, hours before the first tour boats can arrive, our guests are having the whole trail completely for themselves. Meet up with a family of Dusky Languor monkeys. This species allows to be observed incredibly close. For the completion of the trail, basic fitness and shoes are a must but the reward is a fantastic panorama of scattered limestone islands. On the way back say hello to the monkey family. 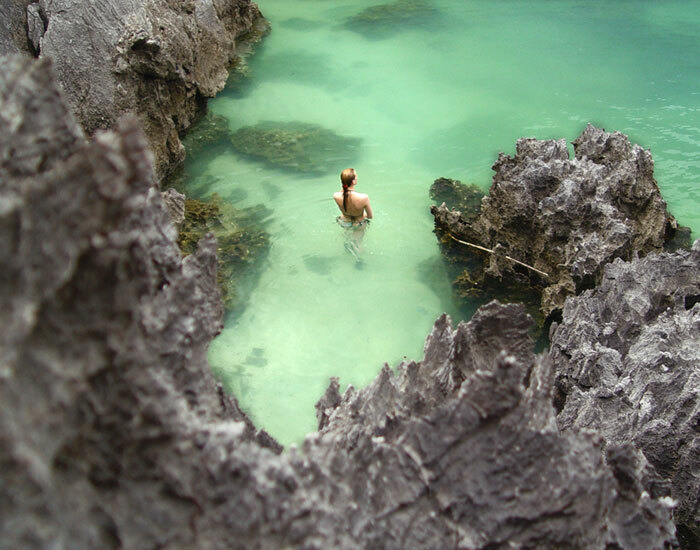 Once you’re back on the beach, have a little break before heading to Bua Boke Cave. When you return, lunch will be waiting aboard your temporary home. After lunch we will set sails for Koh Saamsao and have a look at the famous stone bridge. We will also have time to enjoy some snorkeling in the bay. Then it will be time to hoist the anchor again and get to the final destination of the day, Koh Mae Koh. After a little beach exploration dinner will be served on board your charter yacht. After breakfast we’re visiting Talay Nai (inner sea), an emerald green lagoon surrounded by limestone bluffs, connected to the sea only by an underwater tunnel. Looking at this natural wonder tells you up and close how somebody could have lived the life described in the book “The Beach” by Alex Garland. It’s time for going up anchor again and start sailing towards the northern islands of the Angthong Marine Park where we will find a small lagoon at Koh Tai Plaow. Once we get there and we notice one or two tour boats, we’ll be having a change of plan, and set with our fast dinghy, over to Ko Ngam and Ko Rork to go snorkeling through some cool cave tunnels! We are on a flexible schedule here. Mostly the area around these islands has good visibility under water. When you’re snorkeling through a tunnel from the eastern to the western side of Koh Rork, the tunnel opens on the other side and gives you the view to a perfectly alive coral garden. Some of our guests are a little bit afraid of the little black tip reef shark who is waiting for us at the other tunnel entrance but after a little mental support, most of them wouldn’t want to miss this attraction. After the tour boats disappeared we’ll still have time to visit the little lagoon on Koh Tai Plaow, one of many attractions of the Angthong Marine Park. On request, and if our customers need internet access we’ll be setting sails after lunch and do the 5 hour sail to Koh Phangan where our guests can have an evening ashore after dinner. In the morning we will hoist the sails and be on our way to sail back from Koh Phangan to our home harbor in Koh Tao. The journey will take about seven hours and we’re expecting to have really relaxed downwind for proper sailing waiting for us. We will drop anchor in Mae Haad or Sairee at about 4-5pm, early enough to find a room if you need to. If you need accommodation on Koh Tao, we will be happy to assist you. 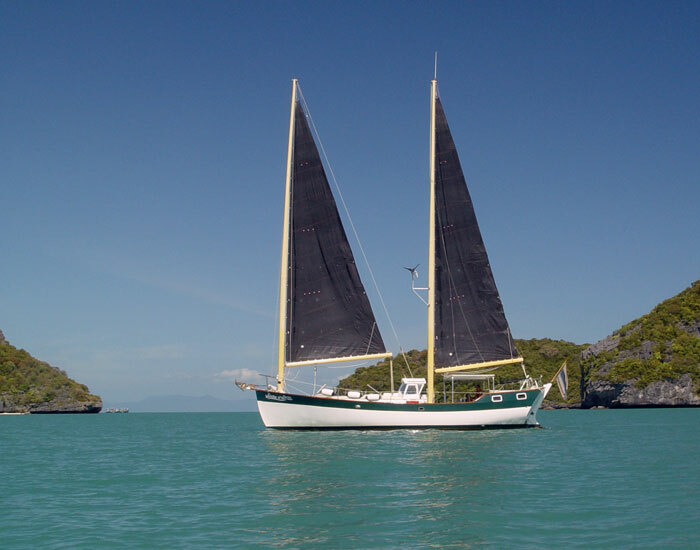 Book a sailing charter in the Gulf of Thailand aboard the SY Freedom Fargo, our 40 foot ketch rigged sailing yacht. She can easily accommodate four overnight guests on longer yacht charters and up to twelve guests during the day for parties, celebrations, snorkelling and site seeing trips. 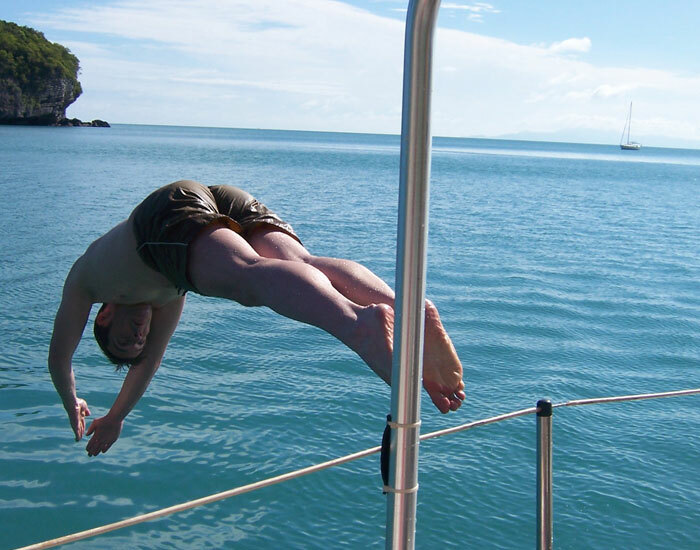 We pride ourselves on tailoring sailing adventures and sailing courses to your needs. For an extra charge, we can pick you up and bring you aboard our yacht from any Gulf of Thailand location. The drinks cabinet can be pre stocked with your favourite tipples and any dietary requirements met. For couples, SY Freedom Fargo boasts a large private aft double cabin, and a comfortable double cabin in the bow that has closer proximity to the toilet and washroom. Between the saloon and the aft cabin, the center cockpit is large and comfortable enough to seat 6-8 people. Dinner times can either be spent inside the saloon (should the weather be bad) or outside seated around the central wheel house table. The gallery below is a collection from our sailing adventures in the Gulf of Thailand. 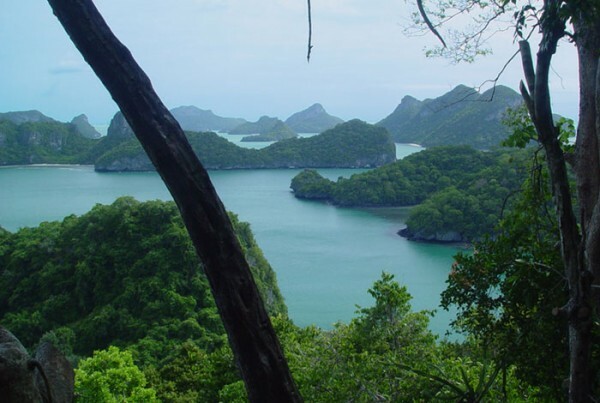 Our customers regularly book sailing yacht charters from Koh Tao to locations like Koh Pha Ngan, Koh Samui, Sail Rock for incredible snorkelling and incredible destinations like the Mu Koh Ang Thong National Marine Park, a jewel in the Gulf of Thailand. Returning from a full day charter aboard the SY Freedom Fargo. Sailing Dinghy Rental Fleet @ FLOWER Restaurant, South Sairee Beach, Nr MAYA Beach Club, Koh Tao. Thailand. one of our sailing dinghies? – Call today on 093 645 2826. We have five sailing dinghies, located on south Sairee beach in front of the fantastic “Flower Restaurant”. Our customers get 10% discount if they order food from Flower. Perfect for relaxing after you’ve worked up an appetite whilst sailing. Solo Sailing Rentals work like this: You sign a disclaimer vouching for your competency in sailing your chosen dinghy. Next, we take payment and give you a detailed briefing on the underwater topography of Sairee beach. There is lots of coral around koh tao and we take the protection of this incredible asset as seriously as any dive school. We teach you how to avoid damaging this coral, yourself and our boats by sticking to the designated safe track in and out of Sairee. Then, we watch you rig your sail boat and help you into the water, when you are sure you are ready, we let go and its all on you. We want you to have fun with our sailing dinghies but please be prompt with their return. Bookings can get pretty close together in high season and we don’t like our next customers to have to hang on too long for their ride. Skippered Sailing Dinghy Rentals work like this: You don’t have to sign a disclaimer because your skipper is in charge. All you need do is get in touch with us by phone or email to book a sailing trip. We will meet you at the boats or guide you down Flower Restaurant from the office in Mae Haad. Your Skipper will rig the boat ready for your departure, supply you with life vests and mask & snorkels if required. Then you will be briefed on any safety concerns and taught how to move across the boat while underway. If there is more than one of you, you may be asked to assist in guiding the boat out into sufficiently deep water before jumping back aboard and getting underway. For this you will be provided with reef shoes to protect your feet from the razor sharp corals. The Laser Standard is the most popular race sailing dinghy in the world with over 200,000 built. It is fast, highly maneuverable and a blast to sail in any wind condition. We also have two smaller sails for the Laser enabling anyone of any skill level to sail with peace of mind. The Hobie Getaway is a catamaran designed for 1-6 people. It is comfortable, fast sailing dinghy and a perfect snorkeling platform. It also boasts dual watertight compartments that double as coolers for your beers on longer excursions. © 2019 Sailing Koh Tao. All rights reserved, Island Cruises Company Ltd.